Undercrown Maduro hand-rolled premium cigars were born on the factory floor when the torcedors (cigar rollers) responsible for Liga Privada were told they could no longer smoke Ligas while they worked because the Drew Estate Company was already struggling to meet demand. They instead created their own blend using tobacco bought for Liga Privada but not specifically used in the blend. The difference between Liga Privada and Undercrown Maduro are the wrappers. Liga Pivada uses a Connecticut broadleaf while the Undercrown Maduro is wrapped in a dark and oily Mexican San Andres leaf. 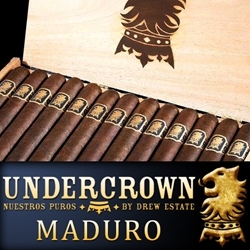 Undercrown Maduro premium cigars are infused with fillers from Dominican Republic, Nicaraguan Criollo and Honduras inside a fine Brazilian binder, all bundled up in a beautiful Mexican San Andres leaf, This combination give the cigar a medium to medium-full strength with a taste profile that is lush, smooth and creamy with a natural inherent sweetness. Altogether the Undercrown Maduro is refined and balance with excellent depth for the smoker.